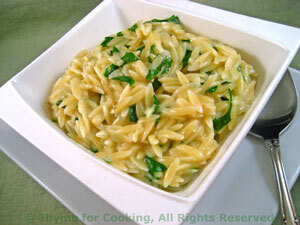 Orzo with Herbs, creamy, simple, side dish from Thyme for Cooking. I cook orzo the same way I do rice, in just enough stock. It gets very creamy. Melt butter over medium-high heat in small saucepan. Add orzo and cook for 1 minute, stirring constantly. Add stock and bring to a simmer on medium heat. Turn heat to low and simmer until done, about 15 minutes, stirring occasionally. All stock will be absorbed. Stir in cheese and herbs. Remove from heat and serve. This will be creamy, not stiff.